Originally appeared in the January 3, 2013 edition of the Southside Times. In cooking cliques there exists the Q-and-A tradition of quizzing ones culinary comrades with this scenario: if you died tomorrow, what would your last meal be today? And I’ve listened to a gastronomic gamut of responses—foie gras, langoustine, otoro tuna, kobe beef, caviar. But, when queried, I’ve often followed the impulse to make a nostalgic return to the formative and financially modest days of my culinary vocation. When I was a student in Chicago, I didn’t have the cash to buy filet mignon, but if I could get my hands on an economical cut of beef at the nearby market, I could use a few vegetables, a small amount of stock along with a bit of leftover wine to conjure something magical. 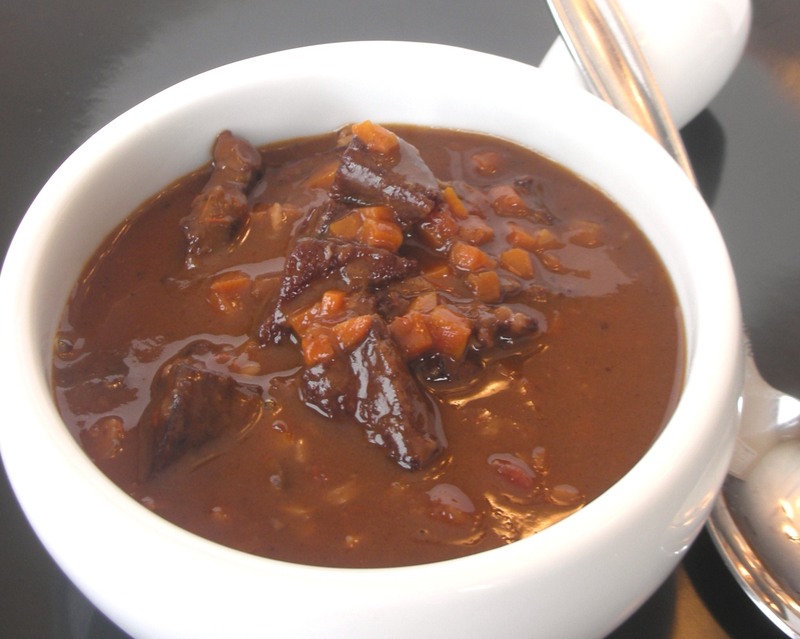 Daube of beef is a stew which was a staple of the provincial poor in France. There are countless variations which call for different cuts of meat and particular piece of equipment. Though purists would urge you to use a daubière (a uniquely shaped pot well-suited for braising) a sturdy stockpot will do the trick. And tell you what: you bring along a crusty baguette and some parsley and caper salad and we can enjoy this meal together. So long for now, dear reader. 1. In a high-sided stockpot, season and sear the beef in batches, reserving on a plate when meat is browned and mahogany colored. Remove and reserve on a plate. Sauté onion and carrot for several minutes; add garlic and cook briefly (don’t burn). If more fat is required, add a small amount of olive oil. Add tomato paste and stir until vegetables become dark. Add a small amount of olive oil along with flour; stir to form a paste. Add wine and, using a wooden spoon, deglaze bottom of pan by scraping up browned bits. Add beef back to pot and pour in water or stock until liquid just covers the top of the meat (depending on pot size, may need to adjust liquid). Add bay leaves and bring to a gentle simmer and cook for until reduced halfway. 2. Occasionally skim impurities from the top of the stew, and be vigilant about the liquid (meaning you may need to make further additions if reducing is too rapid). Adjust seasoning with salt and pepper. 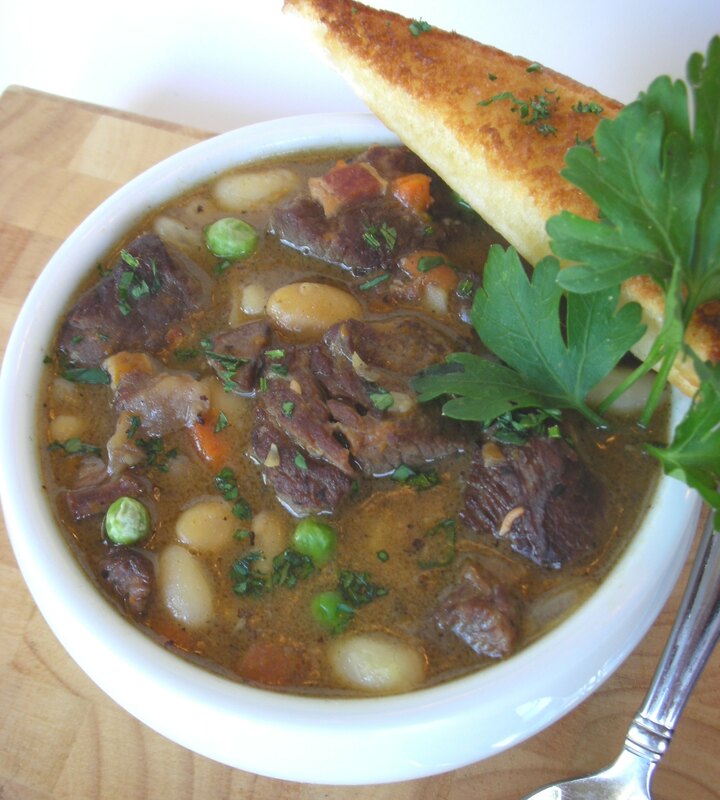 When stew is thick, flavorful, and beef is tender, ladle into large bowls ad serve with crusty baguette and parsley and caper salad.